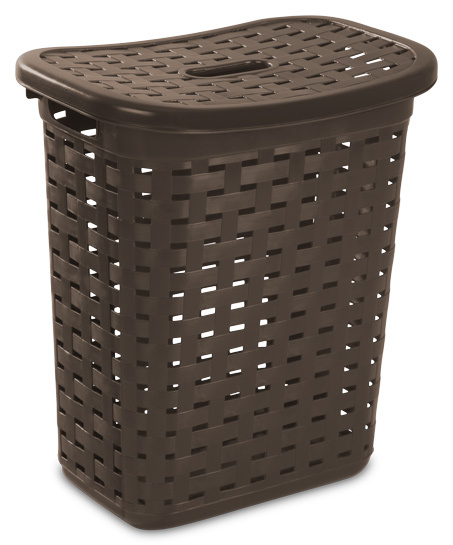 The Weave Laundry Hamper combines the decorative look of wicker with the convenience of easy-to-clean durable plastic that will not snag clothing, and adds a touch of fashion to everyday laundry chores within the home. The wide weave pattern allows for ventilation and the lift top lid contains and conceals clothes stored inside. 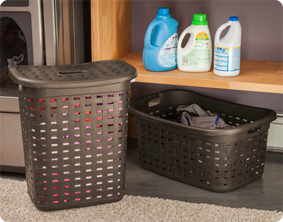 The handles integrated into the sides of the base allow for easy and comfortable lifting and transporting of items to and from the laundry room. This item was designed with a sturdy construction and a reinforced rim for long lasting use in the home. The premium styling and elegant weave pattern complements all décor within the home. The overall dimensions of this item are 19 7/8" L x 13 5/8" W x 22 3/8" H.
Overall Assembled Size: 19 7/8" x 13 5/8" x 22 3/8"
This decorative large capacity hamper is perfect for family use! 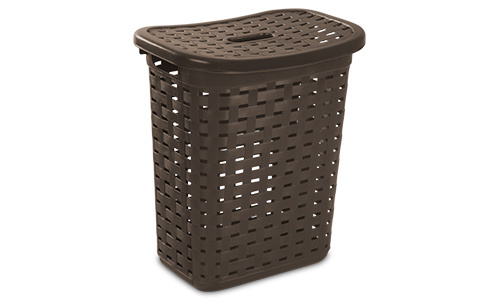 Weave Laundry Hamper is rated 4.7 out of 5 by 3. Rated 5 out of 5 by jpal7573 from easy to pick up very easy to pick up - i have back issues so i needed a lightweight hamper i can take up and down the stairs and this worked great. the color matches my bedroom so its great for me plus the holes are great vents so clothes dont over smell. Rated 4 out of 5 by Sewingnut from Love this hamper I love this hamper, but I don't understand why it doesn't come in more colors. Been looking for one just like this for ages, except I need it to be burgundy. Why can't we get colors anymore?